The area around fisherman's wharf was named "Tai-no-ura". The left side of this photo is the Pacific Ocean. Nichiren Daishonin was born in 16 February, 1222, in Kataumi, Tojo village, Nagasa county, Awa province (at present, Kominato, Kamogawa city, Chiba prefecture, Japan). His father's name is Mikuni no Taifu, and mother's name is Umegiku-nyo. His childhood name was Zennichi-maro. He had lived in Kominato until 12 years old. Unfortunately, the place of his house where he was born was broken because of encroachment by sea wave, and it is not remained now. Tanjoji means Birth Temple in English. But its religion is Nichiren-shu Minobu School. There are some strange things, roof tile writing Nam-myo-ho-renge-kyo, fortune slip, offertory box, and so on. It must be commercialism and "slandering the Lotus Sutra" I saw a stone statue of Zennichimaro, Nichiren Daishonin's childhood. 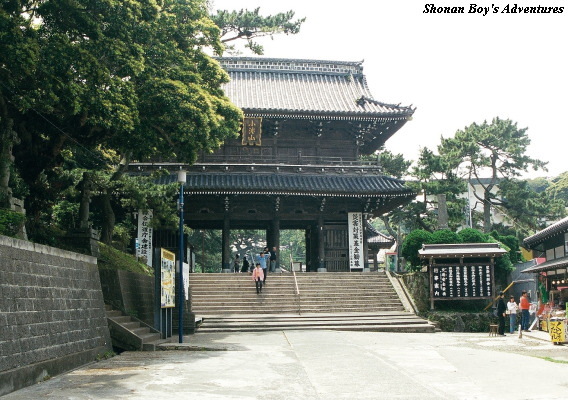 In 1276, Umegikunyo, Nichiren Daishonin's mother stayed this place because she was sick. I wanted to see the museum at Tanjoji, I did not have enough time. The explanation about Nichiren Daishonin written at Tanjoji is wrong. All the people should not believe it. There was not Nichiren Daishonin's house, because it was destroyed by earthquake. 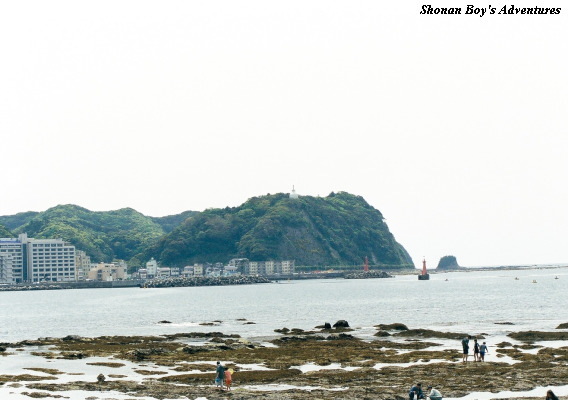 Kominato is fishery town, especially many red sea breams. Visitors need admission fee at "Hobutsu-kan(Treasure Museum)" only. There are the reproduction of writting of Nichiren Daishonin, "Letter to Brothers", "Rissho Ankoku Ron", "Object of Devotion for Observing the Mind Established in the Fifth Five-Hundred-Year Period after the Thus Come One's", "The Selection of the Time", etc in it. Please check the business time and holidays before you visit. From Awa-kominato station on JR Sotobo line, 20 minutes walk. From Awa-kominato station, 5 minutes by taxi. From Awa-kominato station, take the Kamogawa-nitto Bus bound for "Namegawa Island" or for "Kazusa-okitsu station". Get off at "Tanjoji Iriguchi" bus stop (3 minutes). And 3 minutes walk. This bus operates once per an hour approximately. From Awa-kamogawa station bus stop through "Tanjoji Iriguchi" bus stop, 26 minutes by bus. This bus operates "Awa-kamogawa station ==> Awa-amatsu station ==> Awa-kominato station ==> Tanjoji Iriguchi ==> Namegawa Island ==> Kazusa-okitsu station", and once per hour approximately. 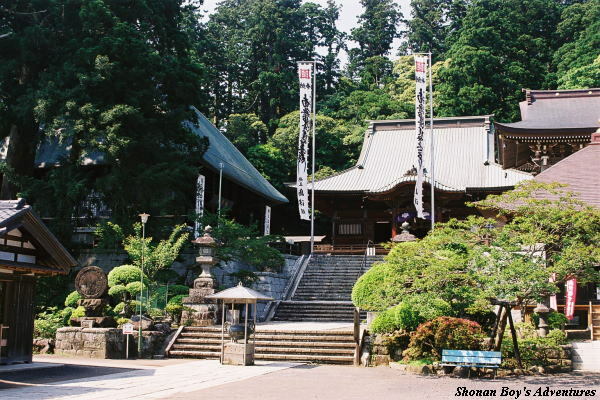 This is the precinct of Seicho temple, and Nichiren Daishonin decided to establish his Buddhism there. Nichiren Daishonin who were chanting to establish his Buddhism, seeing the rising sun. 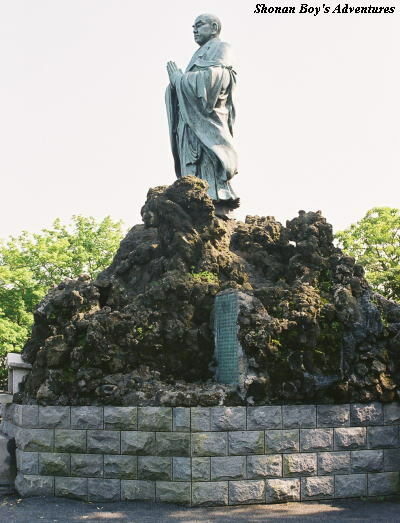 On 30 August, 1923, this blonze statue was completed. This is a direction that Nichiren Daishonin decided to establish his Buddhism seeing the rising sun and Pacific Ocean. 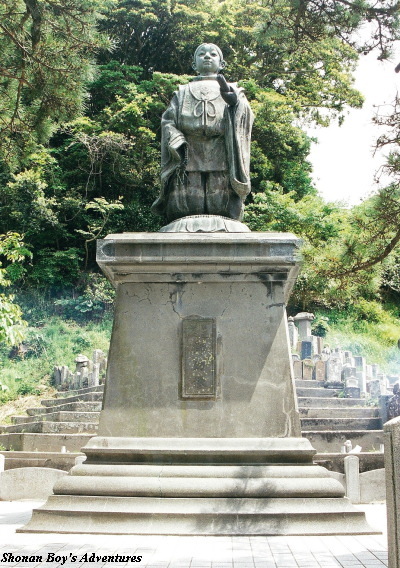 On 12 May, 1233, Nichiren Daishonin began to study both Buddhist and secular teaching at Seicho Temple of the then Tendai school under the senior priest Dozen-bo, when he was 12 years old. When he was 16 years (in 1237), he was formally ordained and took the name "Zesho-bo Rencho" as a priest. Soon after, he left for Kamakura, Kyoto, and so on. And he studied all the sutras, at Enryaku-ji, Onjo-ji, Kongobu-ji, Tenno-ji, etc. When Nichiren Daishonin was 32 years old (on 28 April, 1253), he chanted Daimoku and decided to establish his Buddhism in Asahigamori of Seichoji seeing the rising sun. At noon, in Jibutsu-do of Shobutsu-bo of Seicho-ji, he preached to an assembly of priests and villagers who had gathered to hear the results of his studies. In that first sermon, he declared that the Lotus Sutra is the true teaching of Shakyamuni Buddha, And that its essence, Nam-myoho-renge-kyo, is the very teaching in the Latter Day of the Law that enables all people to attain Buddhahood in this lifetime (Declaration of establishing Nichiren Daishonin's Buddhism, formally). On this occasion he renamed himself "Nichiren (Sun Lotus)". He also severely criticized the widespread Nembutsu (or Pure Land) doctrine as one that drives people into the hell of incessant suffering. Tojo, Kagenobu, the steward of the area and an ardent Nembutsu believer, became furious on hearing this. He ordered his wariors to seize Nichiren. After Nichiren Daishonin's preaching, Tojo attempted to kill Nichiren Daishonin in the mountain. Nichiren Daishonin stopped to go to Amatsu in dark way of mountain, and went to Seirenbo (a temple belonging to the branch of Seichoji) Saijo-hanabusa because he heard the Tojo's intrigue from Jokem-bo and Gijo-bo (disciples of Dozen-bo at Seicho-ji). At daybreak of 29th April, Nichiren Daishonin left it, and visited his parents in Kominato. At that time, his parents started to believe in Nichiren Daishonin's Buddhism, and Nichiren Daishonin named his father "Myonichi" of Buddhist name, and named his mother "Myoren". On the same day, Nichiren Daishonin left for Kamakura in the center of government, and he established the Hut in Matsuba-ga-yatsu, Nagoe, Kamakura. 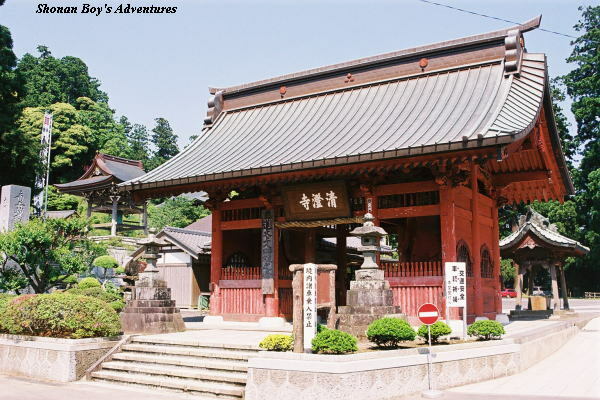 Seicho Temple was established in 771. 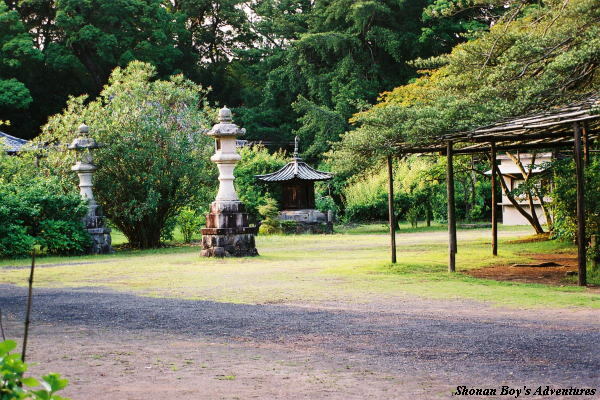 Later it was changed into the temple for T'ien T'ai school, and changed into Shingon Chisan school in Edo era. On February, 1949, it was changed into Nichiren-shu Minobu school. 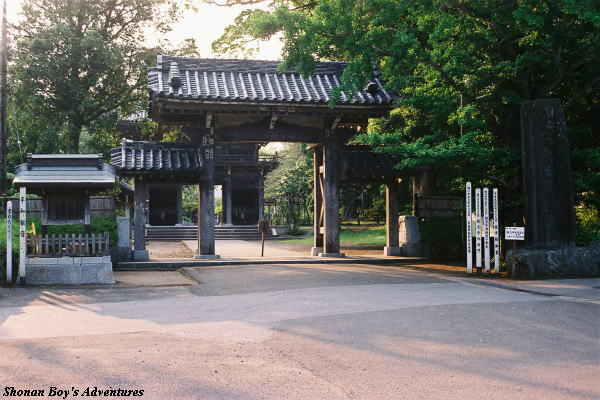 Visitors need an admition fee at only the Hobutsu-kan (Treasure Museum) . 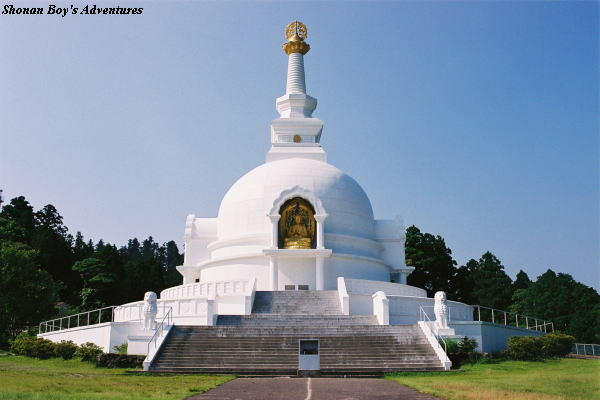 There are some historical materials, such as Nichiren Daishonin and this temple, etc. Especially pen case, and the Gohonzon written by Nichiren Daishonin. Theview from Asahigamori is good, seeing Kominato and the Pacific Ocean. Nichiren Daishonin decided to establish his Buddhism seeing the rising sun and this view. Please check the business time and holidays before you visit. From Awa-amatsu station on JR Sotobo line, 12 minutes by Kamogawa-nitto Bus (operated by Kamogawa City Community Bus) bound for "Seichoji (Kiyosumidera)" or "Oku-Kiyosumi via Seichoji". Get off at Seichoji. 2 minutes walk from Seichoji bus stop. From Awa-amatsu station by taxi, approximately 10 minutes. From Awa-kominato station by taxi, approximately 20 minutes. 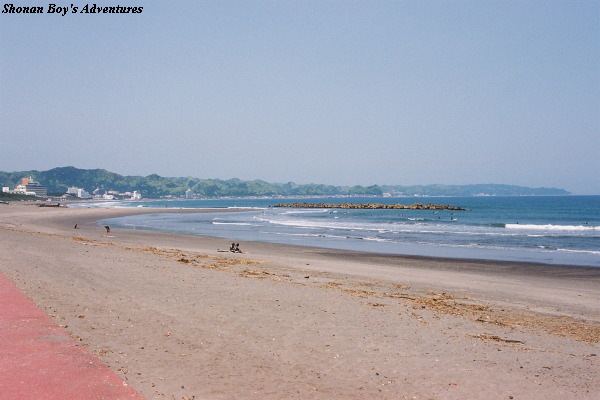 the Place of "Komatsubara Persecution"
This is the one of the Japanese shore selection 100. The left side is Kominato. The view of Pacific Ocean there is beautiful. Another name of "Komatsubara Persecution" is "Tojo Persecution". They let of too many arrows like rain to Nichiren Daishonin and his pupils. Though Kyonin-bo (lay priest Kyonin) protected Nichiren Daishonin immediately, arrows sticked Kyonin-bo on his chest and he was dead. Tojo, Kagenobu tried to kill Nichiren Daishonin on his horse with sword. Then and there Kudo, Yoshitaka came, and he was killed by Tojo, Kagenobu as he fought against Tojo. When Tojo tried to put Nichiren Daishonin to the sword, his sword hit Nichiren Daishonin's Buddhist rosary. When Tojo tried to kill again, Tojo's sword was broken into two. However Nichiren Daishonin was saved his own life, he got hurt on his forehead and his left hand bone was broken. Then Kyonin Temple (Kyonin-ji) was built, but this is NOT what Nichiren Daishonin established. Please check the business time and holidays before you visit. From Kamogawa station of JR line, 6 minutes by Kamogawa Nitto Bus bound for Uranowaki (7 times per day) . And get off at Kyoninji Iriguchi. From Awa-kamogawa station, approximately 20 minutes on foot . From Awa-kamogawa station, approximately 5 minutes by taxi . It was 26 degrees Centigrate, and hot because of good weather. I finished a lunch at the AEON (big supermarket) near Awa-kamogawa station, then I ran at 20km/h slowly by bike toward Amatsu. From Amatsu to Kiyosumi mountain, the road is steep continuously. Though it is hard climing by bike. As I climed Hakone by bike, it was not so hard for me. Finally I arrived at Seichoji, and I was glad to climb steep way of this mountain. 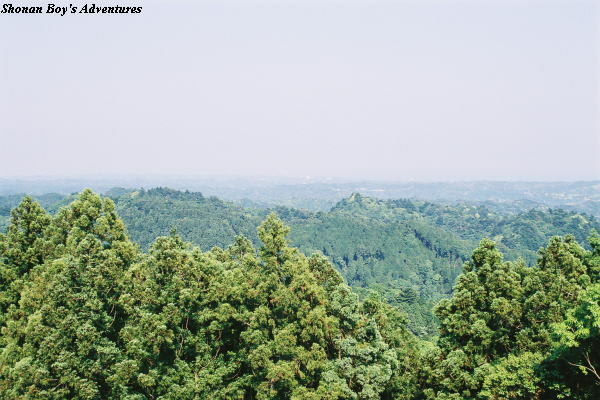 The top of Kiyosumi mountain is located in 377 meter high above sea level. 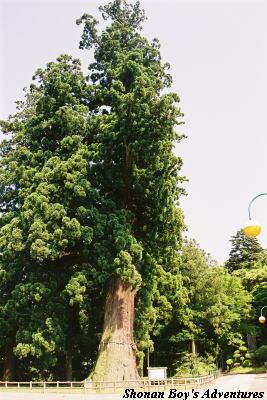 As a result of measuring correctly, Asahigamori of Seichoji is located in 333.6 meter high above sea level. After I saw the Hobutsukan (Treasure Museum) and Asahigamori, I went to Kominato. Continuously I went down this slope. But I was not worried because my bike equipped two disk brakes. I had been to Kominato once at that time, this time is twice. As I did not have enough time then, I visited the Treasure Museum of Birth Temple. And I visited there next day. On the first day of my bike trip, I visited Kyonin Temple. It was difficult to find Kyonin Temple because I did not have detailed map. I think we do not need to spend this place for a long time. 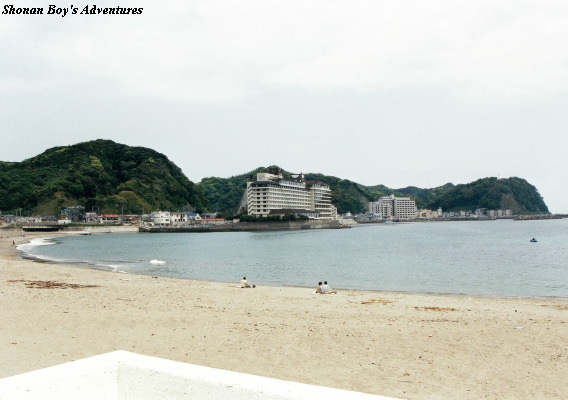 After seeing it, I took the photo in Maehara Yokosuka Beach near Kyonin Temple, and stayed an inn "Green Club" in Kamogawa city. An owner of this inn works as an home economics teacher of part-time at one high school. I ate German cuisine in this inn, and it tasted good. During dinner, I talked with her. I could enjoy nice bike trip for 2 days. Tokyo==>(JR Keiyo line & Sotobo line the "Wakashio" limited express, about 110 minutes) ==> Awa-kominato. When you take this train from Tokyo, it does NOT depart from Platform 1, BUT "Platform Keiyo 1". Please be careful. Most of the limited express trains pass through Awa-amatsu. Passengers who take the train passing through this station, please transfer to the local train at Katsuura. Some of the limited express trains will run as the local trains from Katsuura through Awa-kamogawa. As long as you take only this train, you do not need to transfer. Basically it is the same way as getting off at Awa-kominato. It takes about 2 hours from Tokyo to Awa-kamogawa terminal by limited express train via Awa-kominato.